This interactive webinar explored some of the ways that local governments can build health into the daily life of small towns and rural and remote communities. Speakers provided real examples of how small communities are supporting food security, physical activity and developing a vision for a healthier future. Webinar participants will be encouraged to share their thoughts on how to create healthier communities and to identify priorities and this will be communicated to the local governments of participating communities. DR. NICOLE VAUGEOIS holds the BC Regional Innovation Chair in Tourism and Sustainable Rural Development and as well as leading research she is also a professor in the Department of Recreation and Tourism Management Faculty of Management at Vancouver Island University. She will discuss her research and the multiple benefits that parks and recreation can provide to rural areas. ROSE SONEFF is a Registered Dietitian and Community Nutritionist working in Promotion and Prevention through Interior Health. She will explain how the communities in Williams Lake and the North Thompson have come up with innovative approaches to address both the economic and environmental aspects of local food security issues. 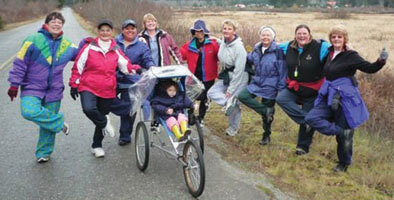 EDNA MCLELLAN, with Northern Health’s Kitimat Health Unit and SHAUN O’NEILL with the District of Kitimat’s Leisure Services Department have long worked in partnership to promote active living, health and wellness. They will discuss the evolution of this collaboration and describe how they’ve been able to make health programs more inclusive and to move inactive citizens to healthier lifestyles. Planning For Healthy Communities: Can We Do A Better Job?